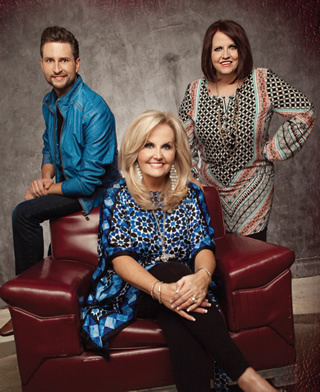 The two-word call to action "Pray now" is not just the title of the trio’s album set to release April 28 — one of 20-plus records the group has released since 1991. It’s not just the title track on a collection of 11 heartfelt songs laden with encouraging lyrics, crisp harmonies and stellar instrumentals. And it’s not just an uplifting melodic message to share with faithful fans and new listeners alike. “Prayer has truly changed our lives, and it has changed the course of our ministry,” Karen Peck says. That’s especially true over the past year, which has found the group living out the hook of the song “Pray Now”: Right here in the storm He’s still the same/there is strength and power in Jesus’ name. 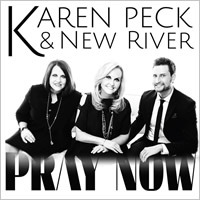 In many ways, the journey toward the new album’s prayerful theme began in January 2014, when New River’s pastor, Jentezen Franklin, challenged their Free Chapel congregation to pray the Lord’s Prayer daily. The trio joined in and almost immediately noticed a positive impact cascading outward as the year unfolded. “That prayer has strengthened my prayer life and all of our lives so much,” Karen says. When the time came to work on their next record, the group knew they wanted to incorporate the Lord’s Prayer. They did so in the title track. “I see now why God was preparing us for the trial and the storms that we’re facing right now,” Karen notes. The fiercest storm hit a few months ago, in February. 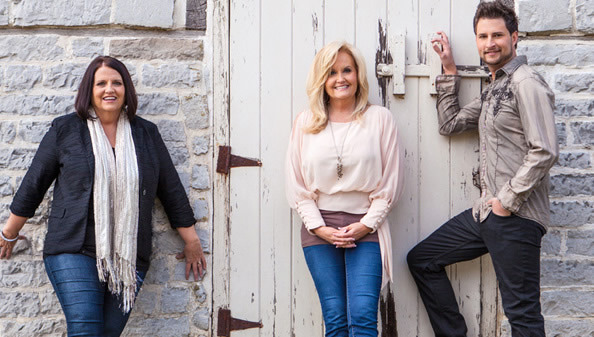 After the songs for the album were chosen and recorded, but before the mixing process, Karen’s husband, Rickey Gooch — also New River’s road manager and sound technician — was diagnosed with cancer after discovering a knot in his neck. He began aggressive radiation and chemotherapy. Her fellow vocalists, sister Susan Peck and Jeff Hawes, echo the sentiment. 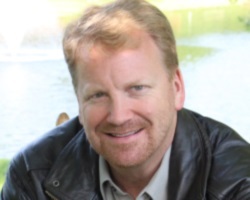 Hawes points to humanity’s longing for meaning and purpose that he believes the new album addresses. “Everybody is searching for something real, for something to hope in, whether you’re already a Christian or not,” says Hawes, who counts the ballad “Blessed” as his favorite tune on the record. The album, like the group itself, is seasoned with familial connections. Karen and Rickey’s daughter, Kari, shines on a bonus track, “A Life That’s Good” — a reflective ode to gratitude. A veteran of Homecoming videos and an accomplished stage singer, Kari, 18, like her brother Matthew, “is on a journey with their dad’s cancer, so this is a really sweet song for her, and the words are very timely,” Karen says. While the season they’re walking through bears an imprint on the new music, Karen emphasizes that the group’s approach remains rooted in its longstanding creative identity. “We never plan the music in advance; we just always go into the studio and let things happen as the Holy Spirit leads,” she says. “That seems to work well for us — to say, ‘Here, God, make these songs like You would have them be.’ And He always does.